Football is the planet's biggest sports event and its fans can create a new nation. Staying updated with latest news, scores and results about FIFA World Cup Brazil 2014 is everyone's demand. Today people are checking various sources to get updates from FIFA World Cup so that they can't miss their favourite team's match. My favourite team is Argentina and I am a big fan of Lionel Messi. So I stay updated with every match played by Argentina. Staying updated with FIFA 2014 Brazil is not a tough task, you can easily do it with your android smartphone. 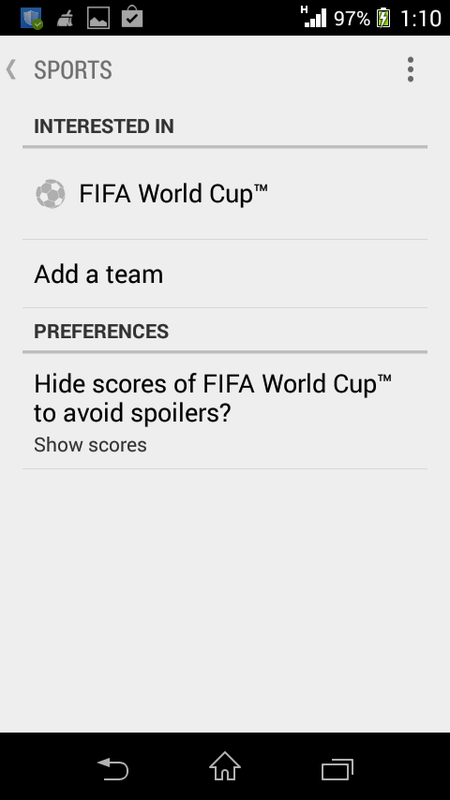 An android phone has 'Google Now' which delivers major updates about FIFA World Cup on your smartphone and the good thing is that you can select your favourite teams to get scores, lineups, stats and match timelines. 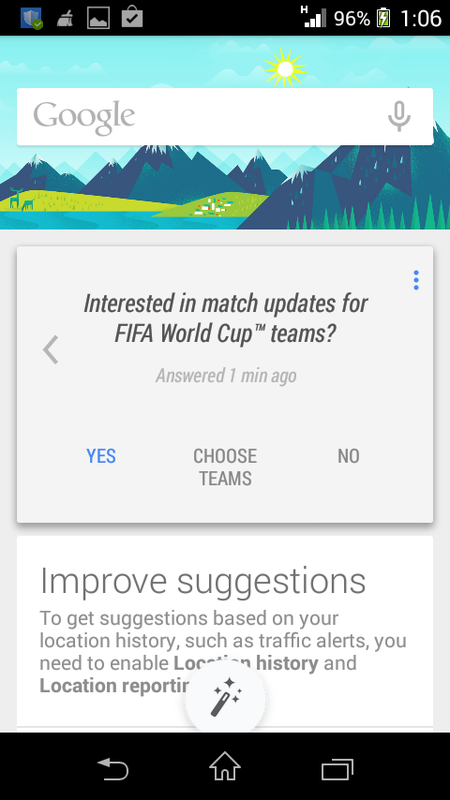 Google Now has recently launched FIFA World Cup Brazil 2014 Google Now cards which automatically ask you whether you are interested in FIFA. First of all update the Google Search app to latest version from play store. Now sign in Google Now with your Google account in 'Settings'. Also enable location based results to get accurate information. When you open Google Now it will automatically ask you 'Interested in FIFA'. Tap yes and follow the steps. You can tell Google Now to fetch your desired info by voice search. Just tap the microphone icon and tell Google Now what to do. For e.g. FIFA World Cup Brazil 2014 tickets, you will get reevant information. Also you can add your favourite teams. To add your teams simply tap the magic stick icon then tap 'Sports'. Here tap 'Add a team' and type the name. Your teams name will automatically come out, tap the name to select. 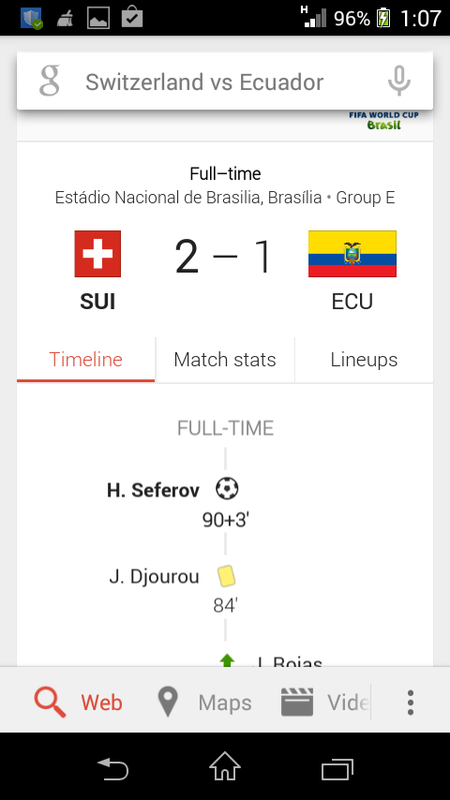 You can add reminder about your favorite teams in Google Now. Just tap the hand icon just before the magic wand. 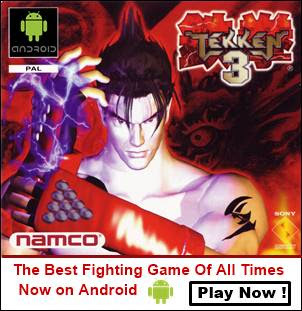 Tap 'Add a reminder'. To set time tap 'Evening' and choose 'Set time'. Enter the name of your reminder and finally tap 'Remind me at this time' to add the reminder.